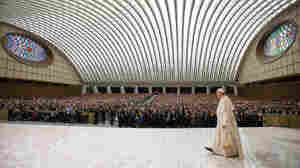 April 29, 2015  NPR's Sylvia Poggioli reports that Francis' remarks, at his weekly general audience in St. Peter's Square, are some of his most forceful statements yet in favor of women. 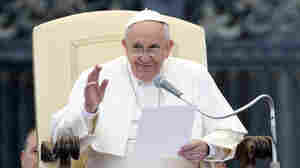 April 29, 2015  Pope Francis is preparing to urge world leaders to take action on global warming — an example of how scientific and religious leaderships can work together for the common good, says Marcelo Gleiser. 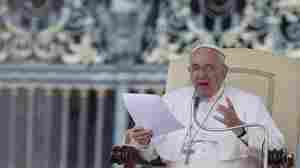 April 17, 2015  The Holy See is in talks for Francis to make a trip to the island nation in September. 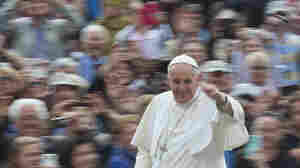 The pontiff helped forge a breakthrough in relations between Havana and Washington. 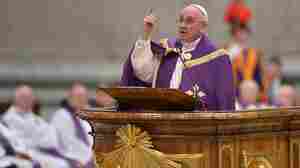 April 12, 2015  Francis, marking the 100th anniversary of the mass killing of Armenians by Ottoman Turks during World War I, described the deaths as a "genocide," causing Turkey to recall its Vatican ambassador. 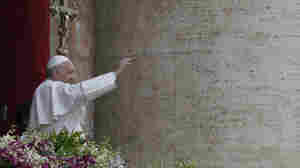 April 5, 2015  Francis, in his annual Urbi et Orbi message, decried the bloodshed in Africa and the Middle East. He also expressed hope for the framework deal on Iran's nuclear program. April 3, 2015  Pope Francis' doctors are telling him to lay off pasta and get more exercise. 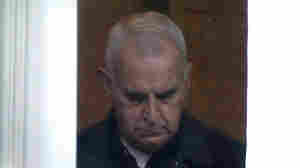 But Francis, who reportedly eats a plate of spaghetti every day, has not taken well to the suggestions. March 29, 2015  Francis noted that schoolchildren were aboard the aircraft thought to have been deliberately crashed by its co-pilot. 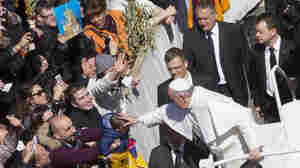 The pontiff also paid tribute to "martyrs" killed for their faith. March 21, 2015  Keith O'Brien, who stepped down as Archbishop of St. Andrews in Scotland two years ago, will be stripped of his privileges but not his title, the Vatican says. 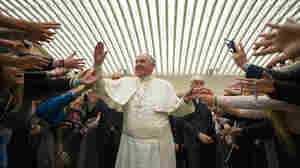 March 14, 2015  As the second anniversary of his papacy nears, Pope Francis has made significant progress in bringing transparency to the Vatican's finances and Cardinal George Pell is carrying out sweeping reforms. March 13, 2015  Pope Francis also said he misses the relative anonymity he had as a bishop — and that he'd like to sneak out for a pizza, unrecognized. 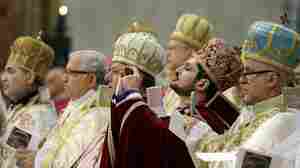 February 14, 2015  In a formal ceremony, 20 prelates became princes of the Catholic Church. The new cardinals mark a shift in the church under Pope Francis toward poor nations — and away from Europe. 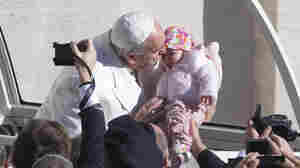 February 12, 2015  Francis spoke of a "greedy generation" that is opting not to procreate. 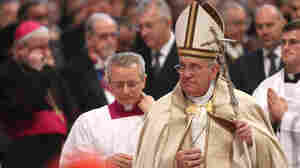 His remarks come less than two weeks after he said Catholics do not need to breed "like rabbits." February 7, 2015  Pope Francis and the Vatican have recognized Romero, who served as archbishop of San Salvador, as a martyr. NPR's Scott Simon reflects on his life, and the possibility he might become a saint. 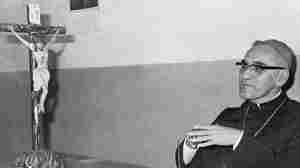 February 5, 2015  Pope Francis has declared slain Archbishop Oscar Romero a martyr. 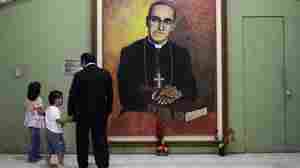 Previous popes declined to do so, possibly because of Romero's role in liberation theology. 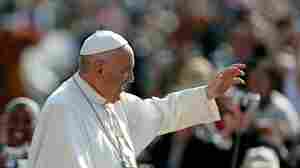 February 5, 2015  House Speaker John Boehner says Francis will address lawmakers on Sept. 24 during his first papal visit to the United States.